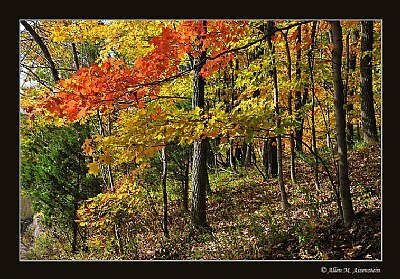 About Autumn view in Ralph Stover State Park, located in upper Bucks County, PA.
Ohhhh,how beautiful Allen!! !How could I missed your double awards!!!!!!!!!!!!!!!!!!!!!!!!!!!!!!!! CONGRATULATIONS...very well deserved!Fantastic colors and a great composition. just a double award well deserved it! Una delicia de paleta otoñal en este rincón! Hi again Stan. The color is mainly due to the backlighting with sunlight passing through the leaves. I prefer backlight to front light when I can get it. thanks for the reply Allen. Just trying to figure out how the saturation can be captured in these shots. This was a text book one. the texture of bark and leaves is great. Nice saturation and exposure. Good composition and balance of the image. Was this about 1/30 at f16? Just guessing. Beautiful autumn scenery, Allen! Looks like a great State Park to visit.